On February 20, 2018, Venezuela has launched the “Petro” (PTR), a government-made and controlled cryptocurrency, based on Venezuela’s huge petrol reserves of about 301 billion barrels of petrol. 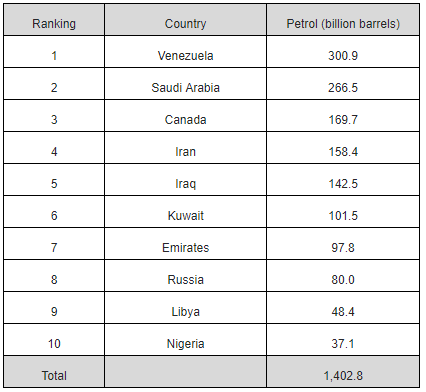 The Petro’s value will fluctuate with the market price of petrol, currently around US $61 per barrel of crude. The Petro was essentially created to avoid and circumvent illegal US sanctions, dollar blockades, confiscations of assets abroad, as well as to escape illegal manipulations from Florida of the Bolivarian Republic’s local currency, the Bolívar, via the black-market dollars flooding Venezuela; and, not least, to trade internationally in a non-US-dollar linked currency. The Petro is a largely government controlled blockchain currency, totally outside the reach of the US Federal Reserve (FED) and Wall Street – and it is based on the value of the world’s key energy, hydrocarbons, of which Venezuela has the globe’s largest proven reserves. In a first batch Venezuela released 100 million Petros, backed by 5.342 billion barrels of crude from the Ayacucho oil fields of Orinoco; a mere 5% of total proven Venezuelan reserves. Of the 100 million, 82.4% will be offered to the market in two stages, an initial private Pre-Sale of 38.4% of so-called non-minable ‘tokens’, followed by a public offering of 44% of the cryptomoney. The remaining 17.6 million are reserved for the government; i.e., the Venezuelan Authority for Cryptomoney and Related Activities, SUPCACVEN. Today, the Petro was born and we will formally launch the initial pre-sale of the Venezuelan Petro. Venezuela has placed herself in the vanguard of the future. Today is a historic day. Venezuela is the first nation to launch a cryptomoney, entirely backed by her reserves and her natural riches. President Maduro has later affirmed that his country has already entered contracts with important trading partners and the world’s major blockchain currencies. Can you imagine what this means? It sets a new paradigm for international trade, for safe payment systems that cannot be tampered with by the FED, Wall Street, SWIFT, New York courts, and other Washington puppets, like the European Central Bank (ECB), the unelected European Commission (EC) and other EU-associated Brussels institutions. It will allow economic development outside illegal ‘sanctions’. The Petro is a shining light for new found freedom from a hegemonic dollar oppression. What is valid for Venezuela can be valid for other countries eager to detach from the tyrannical Anglo-Zion financial system. Imagine, other countries following Venezuela’s example, other energy producers, many if not most of whom would be happy to get out from under the Yankee’s boots of blood dollars inundating the world thanks to uncountable wars and conflicts they finance – and millions of innocent people they help kill. Rumors have it, that in a last-ditch effort to salvage the faltering dollar, the FED might order the IMF to revert to some kind of a gold standard, blood-stained gold. Of the 2,300 to 3,400 tons of gold mined every year around the globe, it is estimated that about a quarter to a third is illegally begotten, so called ‘blood’ gold, extracted under the most horrendous conditions of violence, murder, opaque mafia-type living (and dying) conditions, child labor, sexual enslavement of women, many of whom way under-age, abject poisoning of humans with heavy metals, mercury, cyanite, arsenic and more, contamination of surface and underground water ways, vast illegal deforestation of tropical rain forests – and more. That’s the legacy of gold, the MSM, of course, doesn’t talk about. What the world is to aim for is a monetary system based on each nation’s or group of nations or societies economic output. Today it’s the other way around – it’s the fiat money, designed by the Anglo-Zionist masters of finance, that defines economies. Thus, economies in our western world are prone to be manipulated by the rulers and their institutions – FED, IMF, World Bank, World Trade Organization (WTO) – that support the debt/interest-based monetary rules. They are purposefully maneuvered into booms and busts. With every bust, more capital is transferred from the bottom to the top, from the poor to an ever-smaller elite. The energy-based Petro is a first step away from this sham. The world’s ten largest hydrocarbon reserve holders have a capital base of 1.4 trillion barrels of crude. Not bad to start a worldwide cryptocurrency, based on energy, controlled by energy and by all those who will use energy – that might become a world reserve currency, at par with the Chinese economy and gold-backed Yuan, but much safer than the fiat currencies of the US-dollar, Euro, British Pound and Japanese Yen. We are talking about a seismic paradigm shift. Its potential is unfathomable. The move away from the US-dollar hegemony might result in an implosion of the western monetary structure as we know it. It may stop the predator empire of the United States in its tracks, by simply decimating her economy of fraud, built on military might, exploitation and colonization of the world, on racism, and on a bulldozing scruple-less killing machine. The Petro, a secured cryptocurrency based on energy that everybody needs, might become the precursor for an international payment and trading scheme towards a more balanced and equitable approach to worldwide socio-economy development. This article was posted on Tuesday, February 27th, 2018 at 4:37pm and is filed under Capitalism, Cryptocurrency, Culture, Debt, Energy, Federal Reserve, IMF, Money supply, Neoliberalism, Sanctions, United States, Venezuela.